Diablo is hack-and-slay game with basic RPG elements, which is based in a dark fantasy setting developed by Blizzard North and released by Blizzard Entertainment in December 1996. The game is set in the fictional world of Sanctuary, centred around the town of Tristram in the Kingdom of Khanduras. The protagonist is a lone hero who takes upon himself to find what is causing distress in the town's cathedral and is taken upon a journey that brings him down into the deep caves beneath the cathedral, all the way into Hell to combat Diablo, the Lord of Terror. Diablo is probably the most well-known example of the action RPG subgenre. It's arguably the first game that successfully combined the classic RPG genre with action gameplay. This general "action-inspired RPG" concept has inspired a plethora of other games, sometimes derogatorily called "Diablo clones". The game can be played alone or in groups, and there are two separate paths that characters can develop along. The solo game is designed to allow a single character to travel the depths from level 1 down to level 16 alone, without restarting otherwise assisted. The multi-player game (which can be played over the internet, a local network, by modem, or via null cable) allows up to 4 people to play together in the same game. Multi-player characters are constantly saved, while the solo characters are saved only when the player requests it. The multi-player characters, though, can start a new game whenever they want--allowing the same character to clear the first dungeon level over and over, gaining experience, gold, and items each time. Multi-player games come in three difficulty levels, from "normal" to "hell", while the solo game only has one difficulty level. 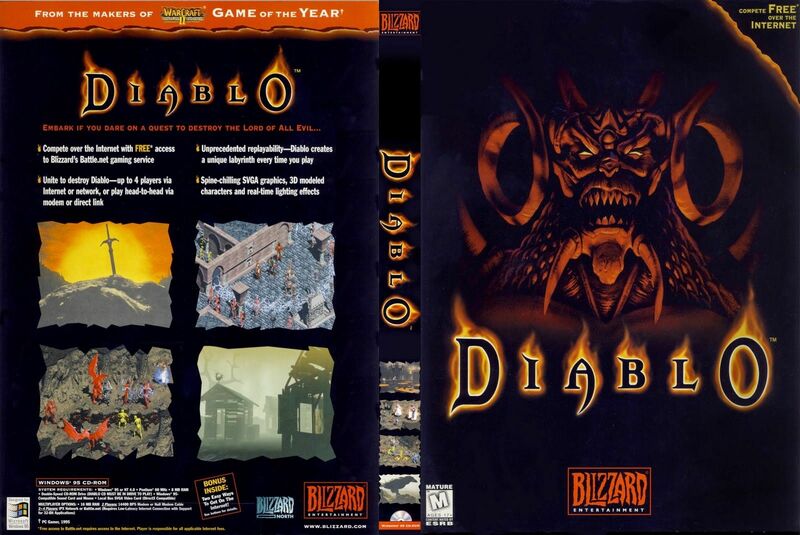 Diablo uses a three-quarters isometric view; the graphics are all 640x480 Super-VGA and 3-D rendered heroes, monsters, and walls alike. The World View of your surroundings takes up a little over 2/3 of the screen, from the top down. Here you see your hero in the center, and you can zoom in or out to enlarge or shrink your surroundings. The bottom portion is the Status and Options area, where you have buttons to access your inventory (which then temporarily unfolds over half of your World View), spell book, disk options, and the like. Also included here is a status line, which updates things such as spells cast or objects acquired, and two globes, one red, one blue. These two globes represent your health and mana, respectively. All interaction, excluding programmable macros, is done through the use of the mouse, including battle. There are three basic types of characters: Warriors, Rogues, and Sorcerers. Each class has their own image set, strengths, and weaknesses. Any character can wield any weapon and wear any armor they find-as long as the base requirements for the item are met. Luckily, magical items can help boost stats-letting low-level or weak characters equip themselves with the heavy armor and weapons found in the depths of the dungeon. There are many items in the game. Around forty different types of weapons, several dozen different types of armor, and almost a hundred unique items. Weapons come in five basic types: staffs, bows, swords, axes, and blunt weapons. Note that any character class can wield any weapon, although the specific strengths and restrictions of each of the character classes lend themselves to the given pairings. Besides weapons and armor, there are also rings and amulets. Magical items are described by one or two special adjectives, which appear as either prefixes or suffixes. Both the solo and multi-player games have their own set of special quests that provide intermediate goals before finally tackling Diablo himself. Quests in the solo game, once complete, often reward the player with unique items that make the journey easier. There are 16 different quests that the game will randomly choose from to put into the solo game, although any single game will have (at most) half of those. Quests in the multi-player game, though, are not as large a part of the game, and are designed for killing of boss creatures on certain levels.